Thanks for taking the time to chat with SIW. Tell us a little bit about yourself and your blog. Dr. L Rathika : I am a medical doctor with more than a decade of experience in clinical practice and subsequently held senior management positions in corporate healthcare, medical content management and health insurance. I currently work on medical content projects independently. Though the impetus for a personal site was to document my grandma’s recipes, I started this blog as a platform to express my interests, passions and hobbies such as vegetarian cookery, drawing & painting, creative writing, reading and listening to music. Hence, I wouldn’t categorize my blog as ‘Foodie blog’, as I am expressing different facets of my personality through this medium and covering a wide range of topics, with a scope to expand in future. What makes your blog so unique and why should people read it? Dr. L Rathika : Most often women, whether career women or home-makers, tend to relegate their interests, skills and hobbies while handling various responsibilities, familial or otherwise. I have often found great potential and hidden skills in women, who are playing a significant family role in the background. I believe creative urge and its fulfillment are common needs of all human beings. Hence, when I felt the need to express the various facets of my personality, I started this blog. I believe those who read my posts, would also want to find a suitable avenue of expression for hitherto unexpressed facets of their personality. In addition, depending on their interest, readers would find my posts in different sections useful and engaging. Not being very active on social media and considering that my blog is only 5 months old, it is encouraging to find my readership is steadily increasing. Dr. L Rathika : Definitely 5 days a week. More often, if time permits. 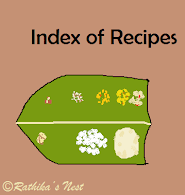 Dr. L Rathika : Minimalistic Indian Cooking’ received the maximum page views. It is about cooking with minimal ingredients and is meant for those men or women, who are staying away from home. Cookery posts such as Idiappam (string hoppers), vegetable biriyani, vegetable roll and masala dosa also generated great interest among readers. In addition, Kitchen glossary and Index of recipes are often visited by the readers. Dr. L Rathika : Owing to my professional and familial commitments, I have not been active on social media other than Linkedin. I have started the Google plus, Twitter and Pinterest accounts only after starting my blog. My Facebook account is also hardly a year old. Hence, my greatest challenge is to obtain visibility for my blog and to expand my readership base, which I am in the process of doing. What are some of your favorite author blogs and why? Dr. L Rathika : I have come across some interesting food blogs. I am yet to explore other blogs to be able to answer this question. What are your favorite books that you would recommend SIW family? Can we really make a living by Blogging? If yes, how we can do that? Dr. L Rathika : My blog is only 5-months-old. Honestly, I have not considered this aspect of blogging. What advice would you give to young women readers of SIW who want to follow a similar career path as you? Dr. L Rathika : It is indeed essential to respect and celebrate yourself to experience fulfillment in life. Hence, grab every opportunity for self expression and use it wisely. All images are property of “Dr. L Rathika” and required permissions have been taken to publish it on www.smartindianwomen.com website. This interview was published by Smart Indian Women under the category SheBlog on 22nd September, 2014. All required permissions have been taken from Smart Indian Women (www.smartindianwomen.com) to post this interview on Rathika's Nest (www.rathikasnest.com).